In planning your social media success, realize your capacity and your customer’s likelihood of engagement. How much time do you have to commit and how are you going to get the attention of your current customers and engage new ones? It’s not that it’s a difficult task, but it is thought-provoking, often time-consuming and so on. From there, decide which channels you want to be a part of, make sure your brand is clear across all mediums and your messaging is consistent. If you immediately pick five social media channels to utilize, why not reel it in and start with two or three instead? Pick a tone and voice that match or reflect your branding. Create a schedule, never more than three times daily, never less than once weekly, and stick to it! Is it really possible to measure ROI on Social? One of the biggest challenges social media managers face is proving the return on investment. It’s a lot of work, especially when you do it correctly, it can be time-consuming and at the same time, it can seem almost impossible to measure how many transactions directly resulted from all that time, all that effort. 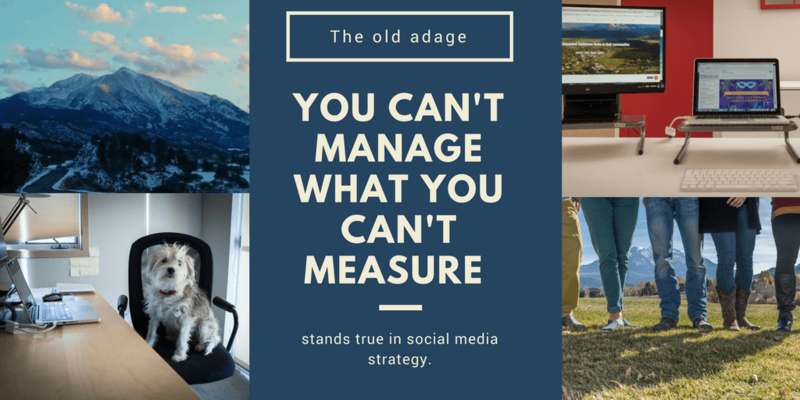 It’s easy to say ‘we need to be on social media,’ but–for small businesses where resources are sparse–the executive team often needs to see how you’re moving the needle. Don’t get swayed by vanity metrics. While important, most metrics provided are vanity metrics: numbers or stats that look good on paper but don’t really mean anything important. Those can be a good measure of your reach, of course, but they can also be deceiving as not every follower is useful to you. Meanwhile, actionable metrics are stats that tie to specific and repeatable tasks you can improve and to the goals of your business. Is it better to have 1,000 great followers that could potentially be customers one day or 10,000 followers that are in a different country that will never buy from you? It’s pretty obvious that you’d rather have a few quality followers that are engaged and interested in what you have to say than high numbers of unqualified followers who are uninterested in your brand. Quality is definitively better than quantity. That being said, knowing what action you really want your followers to make your social media efforts is important to your social media success. Do you want them to click through to your website? Do you want to start more conversations with them through social? Do you want them to claim an offer that you’re sharing specifically through social media? By defining your intention for your followers, you’ll define the action that you want them to take; track those numbers as you’ll see the difference. Social media is as much about branding as it is marketing, so if you make sure that you’re putting your best foot forward and branding yourself as an authority in your industry, you’ll be just fine! Want some support in your social media efforts? Check out what we offer and drop us a line; we’re here to help drive footsteps to your doors!